Thursday and Friday featured below average temperatures as a strong cold front moved through during the early morning hours on Thursday. Our temperatures from Thursday compared to Wednesday were nearly 20 degrees lower and this continued into Friday with a high of 77 reached. Due to the slow moving nature of storms that are forming over the higher terrain and the large amount of water in the air, flash flooding is possible. 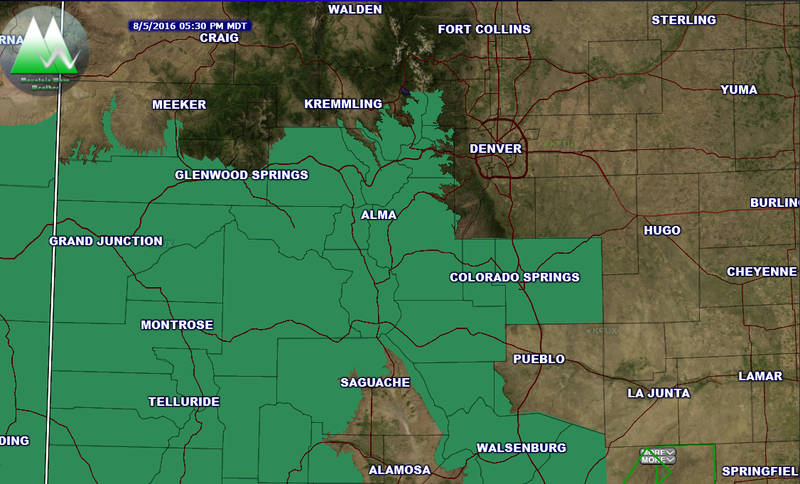 As such a Flash Flood Watch remains in effect for many mountain and foothill locations through midnight. Primary threats in the watch area are slow moving storms with heavy rain and the potential for flooding, rock slides and mudslides. 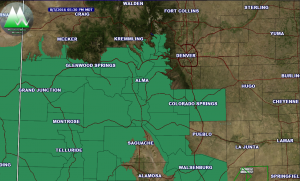 We are already getting indications of another Flash Flood Watch being issued for much of the same areas on Saturday so keep an eye out for that. 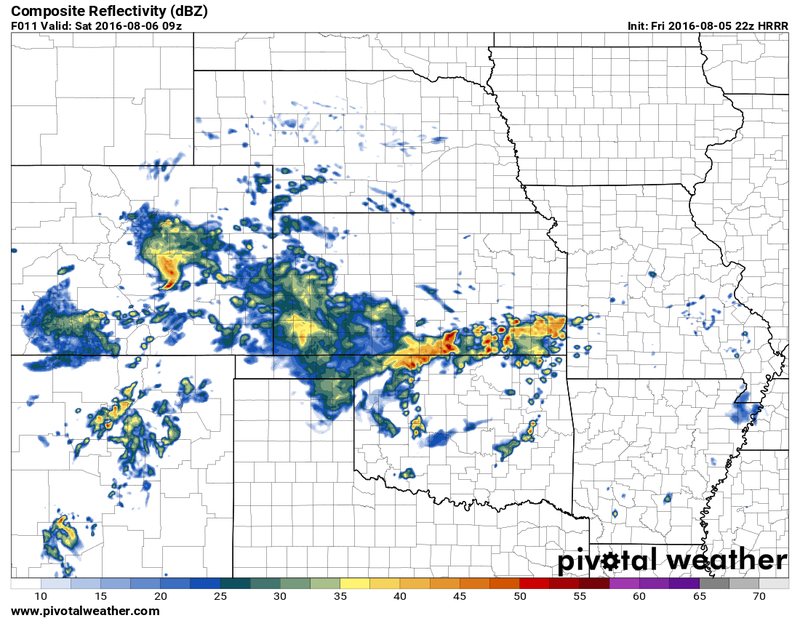 Despite the fact that models have been showcasing heavy rain from this storm system along the front range, we have yet to see much of that materialize just yet. That being said, many models still show heavier rains moving through in the overnight hours Friday into Saturday. Rain from the latest HRRR model run shows heavier rain over Douglas and El Paso counties tonight. This snapshot is at about 3AM Saturday morning. This would be one of those cases where you may hear thunder in the early morning hours past midnight. These models have been showing rain in all areas consistently through the entire duration of this storm system but nothing has yet happened. I’d say rain is likely tonight based on the models and conditions I see developing but it would be a stretch to say there is a 100% chance, I’d put it more around a 60-80% chance. Saturday will be similar to Friday, cooler with cloudy to partly cloudy conditions and a chance of thunderstorms or rain showers later in the day. As we move into Sunday, all indications are we will begin to see the cooler air and moisture filter out of the state. 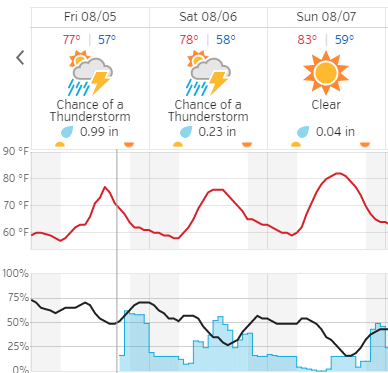 You can see the uptick in rain chances (blue graph at the bottom of the image) late Sunday, I imagine this will be due to left over moisture and convection due to daytime heating. All in all, enjoy the cooler and hopefully wetter weather, it looks like this taste of fall will be brief and we will be back to the hot temperatures and drier conditions as early as Monday. Happy Friday and have a great weekend!